The Israeli Air Forces on Saturday attacked the Syrian government forces' tanks and artillery positions after 10 projectiles fell on the Israeli-controlled part of the Golan Heights from Syria. 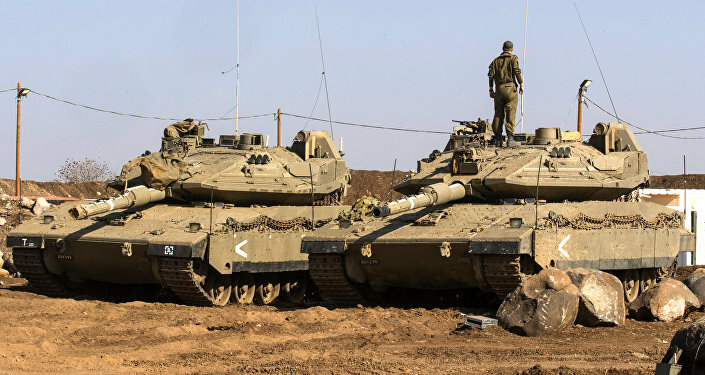 The Israel Defense Forces (IDF) announced that projectiles fired from Syrian territory hit an open area in the northern Golan Heights with no injuries as a result of the incident. Syrian channel al-Mayadeen reported that at least two Syrian soldiers were killed as a result of the Israeli airstrikes. "In response to over 10 projectiles launched from Syria, IAF aircraft targeted origin of launches & 2 Syrian tanks," the IDF stated. Following the attack the Israel’s Defense Minister, Avigdor Lieberman, said that Israel would not tolerate encroachments on its sovereignty and security, even in the form of stray shelling. “We will respond strongly, resolutely and with level-headedness to any such case,” Lieberman added. 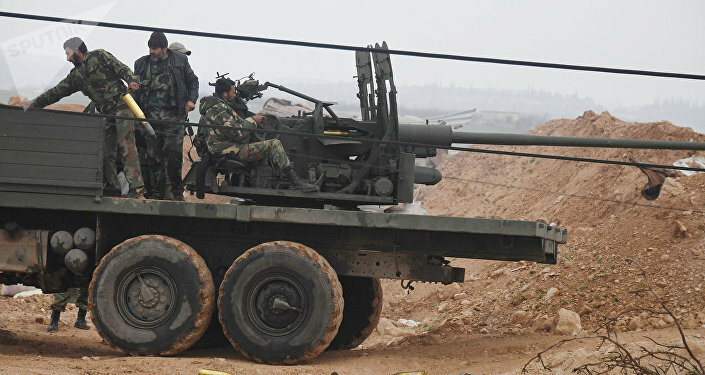 However, the IDF attacked the Syrian Army’s positions despite the statements of the Syrian Army that the missiles toward Israel were launched by accident as it happened during a terrorist rebuttal in Syria. A source on the ground told RIA Novosti that at that time the Syrian army was indeed resisting a major attack on the city of al-Baath in the province of Quneitra from al-Nusra Front. “The army was facing a battle with the terrorists. The attackers suffered heavy losses. Aviation and artillery helped repel the attacks,” the source said. On Sunday, a similar incident occurred with the IDF again targeting the Syrian government troops' positions after several projectiles from Syria landed in the Golans. The majority of such incidents are described by the Israeli military as accidental overspills during clashes between the Syrian government forces and opposition groups. However, preserving control over the Golan Heights is a strategic issue for Israel. The fertile lands of the Golan Heights were part of Syria up until 1967. As a result of the Six Day War in 1967 the border area passed under the Israeli protectorate. In 1981, the Israeli parliament voted to annex two-thirds of the region. The United Nations has repeatedly stated that Israel’s occupation of the Golan Heights is illegal, calling for it to be returned to Syria. Damascus also continues to consider the Golan Heights as illegally annexed. Some experts have noted that the settlement of the crisis in Syria will allow Damascus to direct its efforts on returning the lost territories. Some reports suggest that recently the Israeli military is showing force to Syria due to the alleged plans of the Harakat Hezbollah al-Nujaba movement to create a brigade to liberate the Golan Heights from Israeli occupation. The Harakat Hezbollah al-Nujaba movement, an Iraqi Shiite militia organization, has formed a brigade to liberate the Golan Heights from Israel, spokesman for the movement, Seyed Hashem Moussavi said earlier. “After recent victories (in Syria), we have established the Golan Liberation Brigade," al-Moussavi said at a press conference, as quoted by the Tasnim News Agency. He added, "If the Syrian government requests, we are ready to take actions to liberate Golan." According to the spokesman, the Golan Liberation Brigade is made up of highly equipped and well-trained special forces. Earlier, in May 2016, as a result of the Israeli Air Force airstrike on the outskirts of Damascus, the head of the Hezbollah special services, Mustafa Badr al-Din, was killed. On March 17, the Israeli Air Force once again struck Syria and was fired upon in response from anti-aircraft installations. According to Damascus, the Syrian anti-aircraft gunners managed to shoot down one of the four IDF aircraft. The Israeli side categorically denies this, claiming that all the aircraft returned to the base unscathed, while the S-200 missiles launched from the territory of Syria were shot down by the Israeli missile defense system.